What Is the Difference Between Latex Eggshell Finish and Semi-Gloss Finish? The hardness of a material refers to its ability to shape change from an applied force. It is influenced by many different properties of the material. The hardness of paint influences the workability and surface resilience. Normally, you need to apply several different types of force to determine the hardness of a material. But paint hardness testing usually only involves doing a pencil hardness scratch test. More thorough testing does not give any more information useful to most painters. Sharpen all the pencils in an artist pencil set equally. Inconsistent sharpening can occasionally cause the hardness value to be slightly off. Draw a line on the paint sample with the 9H pencil. This is the hardest pencil in a set of artist pencils. In most cases, the 9H pencil should scratch the surface of the paint when used on it. The pencil hardness rating for a paint not scratched by this pencil would be 9H. Draw a line on the paint sample with each progressively softer pencil. Use the 8H, 7H, 6H, etc., until you have tested the H pencil. The pencil hardness for the paint is equal to the first pencil that draws a line on it without scratching the paint. The H pencil can still scratch softer paints. Draw a line on the paint with the HB pencil. You need to move to the softer B pencils if the HB pencil scratches the paint. Draw a line on the paint using the B pencils in ascending order until one of the pencils draws a line on the paint without scratching it. The pencil hardness is the first pencil that draws a line on the paint without scratching it. The softest paints should be 3B hardness. Harder paints are usually more resilient but more difficult to work with. This is only a general rule of thumb, not a hard and fast rule. 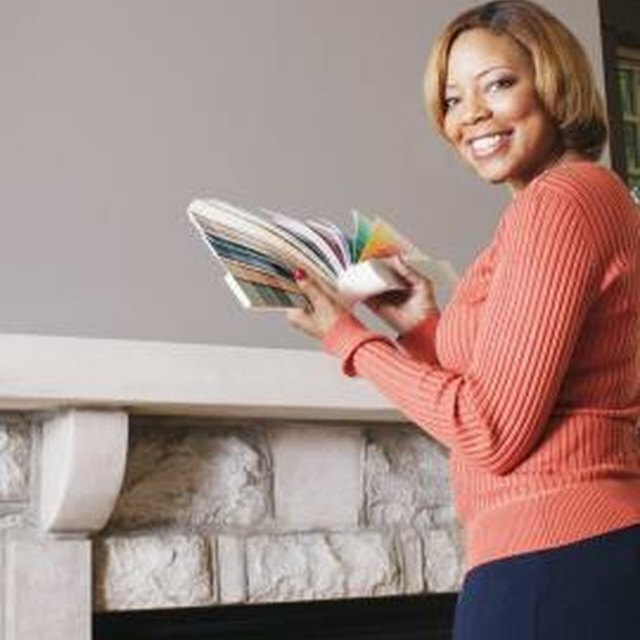 In some situations, a softer paint might be a superior choice in terms of durability. Harder paints are more prone to cracking if used on objects that expand or contract, such as wood furniture, than softer paints. You cannot test the paint hardness if it is covered in a clear coat. This only gives the hardness of the clear coat. It is best to create a new paint sample to determine the hardness rather than sanding off the clear coat before attempting the test. Which Type of Paint for a Kitchen Backsplash? Does Tex-Cote Paint Increase Home Value?